My Writing Journal: Oh, No, What Happened to My NaNo? Oh, No, What Happened to My NaNo? 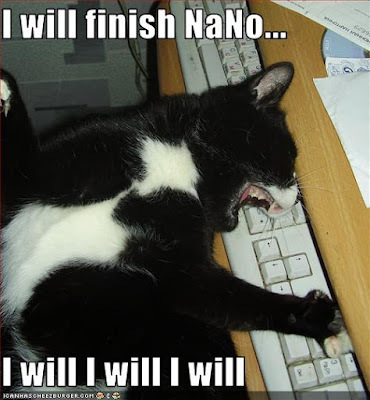 I’m gonna be honest here, it’s not looking good for me to finish NaNoWriMo on time. I have seven days to write 20,000 words. And given that all I’ve been able to manage during the week is 500 a day.... Well, I still have the weekend ahead, and I’ve been known to pull a few miracles off in the name of NaNo in the past, so I guess we’ll just have to see. The thing is, I’m just not feeling it with this novel. I like the characters and it’s not a bad story, I just don’t feel like writing it. At some point, when I feel ready to move forward with this series, I’ll have to sit down and create a guide to the Myste, which plays a major part in the whole story line. But for now all I can do is make it up as I go along. They stared at each other for a few moments and then turned away to watch the Myste. “I probably wouldn’t believe me either,” Nathan admitted. “Are we safe here?” she asked with a shiver. “Sara.” Nathan stopped pacing and came back over to the bench. Sitting down again he took her hands in his. “I’m not going to sugar coat this. The chances of anyone coming back here before we run out of food and water are pretty slim. We’re going to have to take our chances out there.” He waved a hand towards the Myste.